I had to share this story with you that I discovered online about an amazing woman who single-handedly provides food, comfort and healthcare for 40 stray cats in Rochester, New York. She spends about $5,000-6,000 of her own money each year. Janine Wagner is up at 5:30 am every morning, no matter the weather, to care for the abandoned cats. The cats have come to depend on big-hearted Janine’s one-person rescue operation for their very survival. Janine makes her rounds in the inner city--including some drug-ridden parts--delivering food, water and blankets to cats in 9 different locations. As reported by Greecepost.com at each spot there is a “lean-to or cat box” to protect the cats from the elements. CAN YOU HELP JANINE WITH HER WORK? If you would like to make a donation to Janine's Cat Rescue through ChipIn it is greatly appreciated. Your help will allow Janine to buy food, blankets and the necessary supplies the cats need to survive. Sometimes Janine gets discouraged on her blog because she can't help all the cats. Let's show her that we appreciate and support her wonderful work. On her blog, Janine said, "All these animals I rescue are like my children, and when they are adopted, I trust that they will be spoiled and loved just as I would do for them." Dewey, a cat that now has a home because of Janine. I posted the story of Janine on my Careers for Your Cat Facebook page. One of my followers, Jenn Brinkley, generously asked how she could support Janine's efforts. I followed up her question by asking my followers if they would support a ChipIn if I posted it on my blog. This post is the result of the compassionate cat lovers on my site. "My dream," Janine said, "is to have a place to bring these cats where they will not be euthanized, and they will have a safe, warm and loving environment to live their lives out in." If Janine fulfills her dream of having her own shelter, abandoned cats "will have a sanctuary" and be very lucky, indeed. A big thanks to my friend Brian Frum for explaining ChipIn to me. 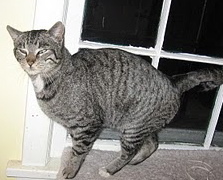 He is a brown and gray adopted tabby who lives with his 4 adopted sisters and is a passionate advocate for all cats. His motto is "Adopt cats, we deserve it!" Follow Brian at his blog here. And Twitter here. That really is a remarkable lady, I gave a little and will also spread the work. I'm very proud of you for helping. People like Janine are so awesome. Thank you for helping. We will try to rustle up a few green papers to help. What a touching story. Our Mom said she will see what she can do about getting some green papers her way. Thank you for letting us know about Janine, Ann! Such a great story..and kudos to you and your followers for starting the ChipIn to help her cause! Cat lovers are the best! I made the Human send a few green papers to this nice lady! Made a small donation, as much as I could. Bless you for helping the kitties! What a wonderful lady. Janine sure makes difference! I chipped in a little..I hope it can help. Thank you for sharing the story. Brian does wonderful work for cats and we like his motto. And your new friend you are raising money for sounds like quite a woman! I do know Janine personally, as a matter of fact I just recently had the honor of meeting her. What a fabulous woman! Fun to be around too! I couldn't resist! I just sent a contribution so that this great gal can continue her mission.